I needed to replace the map light lamp in my car this afternoon and I thought I would go for LED replacement bulbs. The original incandescent bulb's orange glow looks dingy anyway and the last few times I needed to see by way of the map light it seemed rather dim. I figured the local auto parts store would be teeming with LED's as it seems all of the futuristic cars nowadays are jamb packed with the things. This, however, turned out not to be the case. 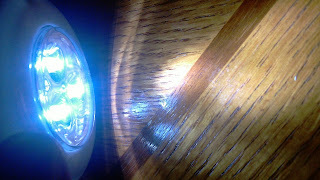 According to the worker at the parts shop, LED's are "high performance" parts and as such, must be custom ordered. I was also told that "the internet has them". Neat. Too bad "the internet" thinks LED replacement bulbs are more valuable than McDonald's orange juice. Not to be out done, I walked to the dollar store next door to the auto parts shop, where I found these beauties for 1$ each. A Trisonic 3 LED Push Light; batteries not included. I bought three, driver/passenger map light and cargo area hence, the $3. In case you were wondering, the text on the bottom front says "To uplift our character, begin with cultivating peace in mind, body, family, and activity.". And on the back, the text "Cultivate a big heart-but a small ego", let me know these were the right bit of kit for the job because, that is exactly what I was trying to do. No, this project wasn't "X to the Z" pimping any rides. And, my car is neither empirically "faster" nor, objectively, more "furious" because of this upgrade. Just humble LED's helping electrons change orbitals to emit photons for me to read maps by. 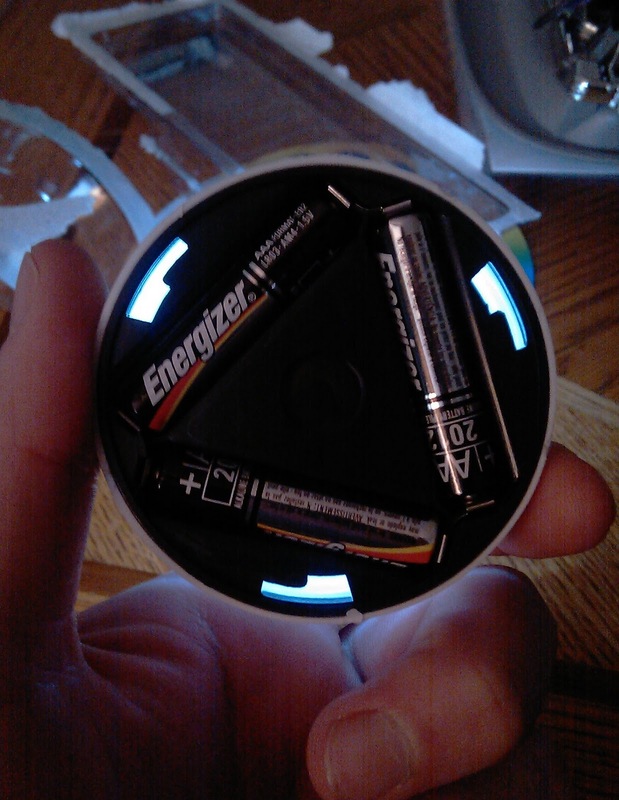 I wanted to verify the light worked as intended and would be bright enough first, before ripping it to pieces. This is what I found inside. 3 LED's, a switch and a single resistor. And just what do we have here? 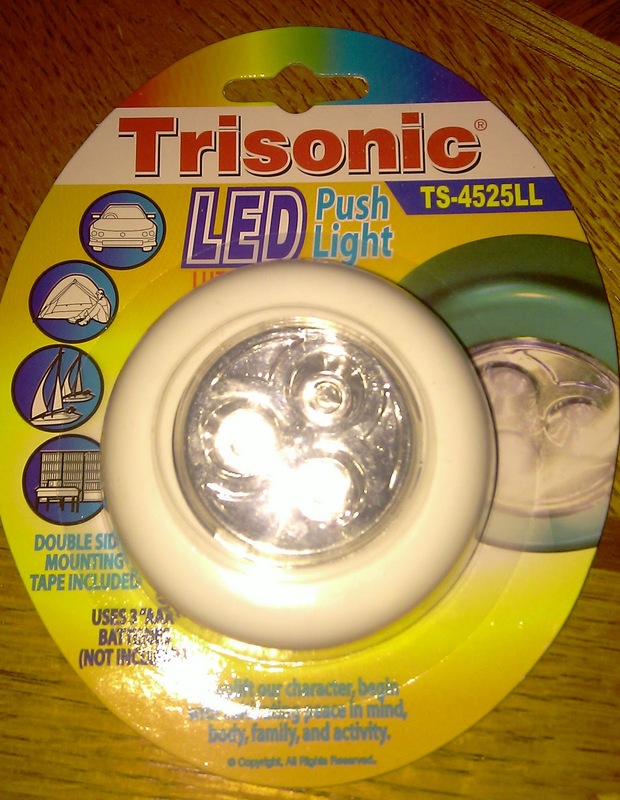 The good people of Trisonic have designed their circuit to have the LED's in parallel. This works for the design specifications of the product they made but it is not helpful to me so I first desoldered all of the components. 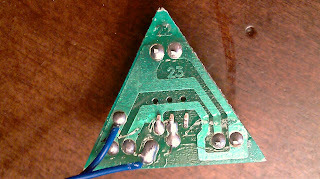 Then, I cut through two of the PCB traces to allow me to solder the LED's back in place in series instead of parallel. While the LED's were desoldered from the board I wired one of them up to a 9v battery through a 1k0 resistor. Measuring the voltage across the LED I got a forward voltage Vf=2.8v. Previously, I had measured the current of all three LED's together to be 130mA before taking this thing apart so, I know each LED can handle at least ~43mA. To select my current limiting resistor for the series LED's I have ((14vBatt-(2.8*3))/40mA = 140R or standard value 150R for 37mA. Power dissipation 0.207W so, a 1/4 Watt resistor is fine. Here, Vbatt = 14v because the car's 12v system operates around 13v with the car running at idle and peaks up to ~14v when the RPM of the alternator increases. 14v is kind of a design for "worst case" scenario with lower battery voltages resulting in LED operation towards safer limits. Here you can see the LED's soldered in the new series configuration and current limiting resistor in place. In series, the LED's are hooked up anode to cathode of each other with a current limiting resistor on one end, the negative side of 12v in my case. 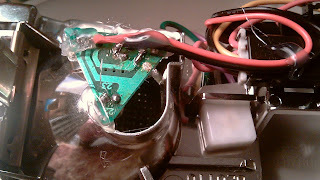 Here you can see the LED PCB hot glued into place in the light reflector housing. You can also see the PCB traces I cut to allow the parallel/series modification. 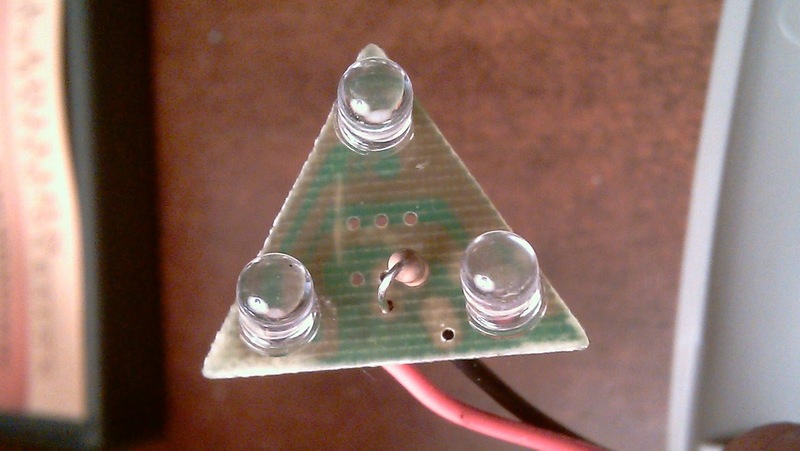 The +/- 12v (nominal) power leads on the LED board are soldered to the wires that used to deliver battery voltage to the incandescent bulb. The connector for the original lamp was left in place electrically and solder joints were insulated against short circuits. 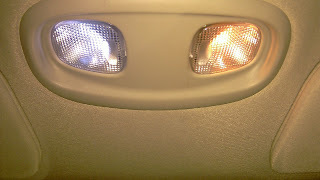 A side by side comparison shows the difference in color of the LED's on the left and the incandescent bulb on the right. The LED's are equally as bright and diffuse quite well so there is no "hot spot" of light. I will perform the same LED retrofit to the right side of the light housing next. This was a fun afternoon project and I am pleased with the results. Average prices for ready made LED replacement bulbs for this style holder seem to be $15 x 3 lights = $45. The method outlined above came in at ~$3 total. Awesome. Wouldn't it be neat if all peripherals ran off of USB ports, so even something like this would be easy to mix and match, instead of having to de-solder and solder. I'm all for steel interiors and just use magnets to mount stuff wherever you want to put it, with USB ports here and there. This just what I was thinking of cause I've been a rental for 2 months a Lincolcn MKS And deciding how I could Mod my lights in my Navigator to LEDS and add AUX input jack of course all to look as factory. Thanks thats one off my list! According to wikipedia High temperature glue guns melt adhesive at 380F. According to weather.com car interior temperatures reach temperatures far exceeding ambient. In this case 138F after 90 minutes in 90F outside temp. Although weather.com doesn't state any details on their test procedure I can assume this is approximately correct. I recall reading in the past that interior car temperatures in direct sunlight such as a dash board being just under 200F on a "hot day". Even so, 200F < 380F. Good catch on the hot glue - Use construction adhesive instead. ...Or you could just go to http://www.superbrightleds.com and buy LED bulbs? 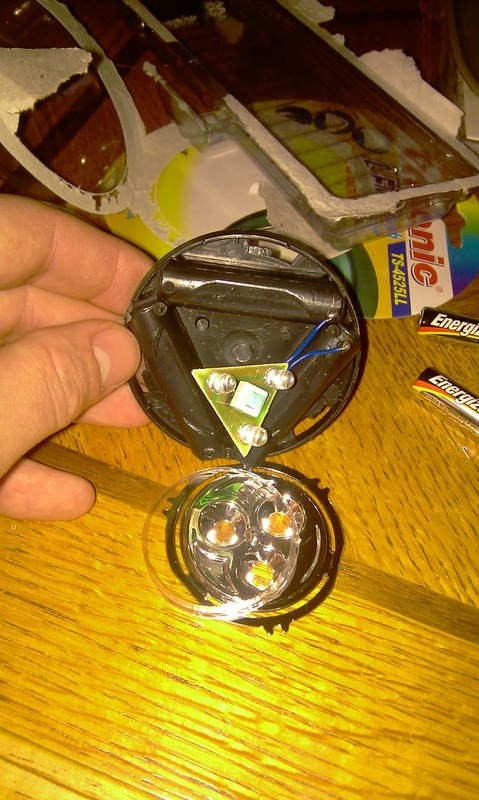 Follow Steven's advice and his link to LED bulbs. No overpriced $15 each deals here. 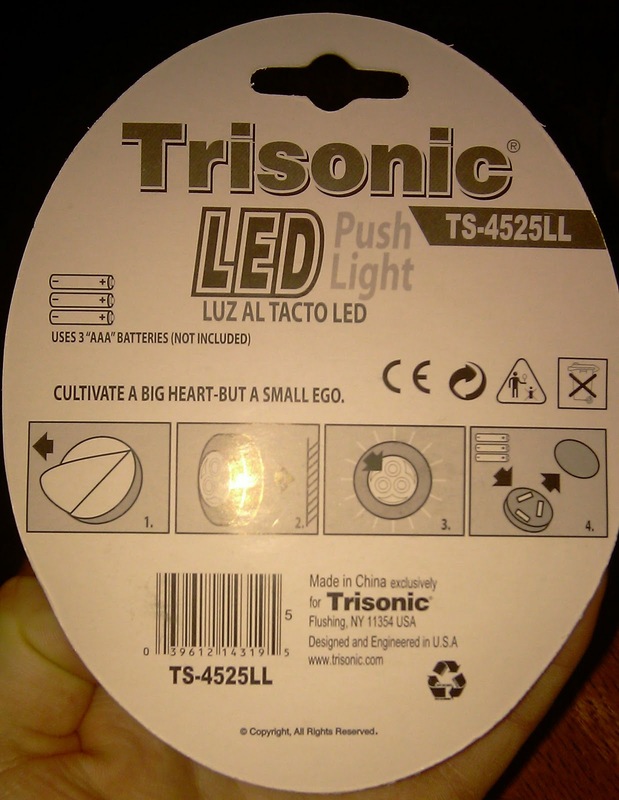 Straightforward stuff and LED replacement bulbs that seem to be little more (some less?) than standard bulbs. No de-solder, re-solder stuff. Just pull the old bulb and put in the new one. I used hot glue with a project in my car once. I came back one day to a gooey mess the consistency of cold molasses. I didn't think it would melt either, but unlike a true solid the melting point isn't fixed. It just starts to flow slowly at warmer temps. any moron can buy his way to a solution (no offense intended to anyone), but Pete used creativity and knowledge to re-use a cheap light into his vehicle. I have a bunch of those tap lights that have worn out their batteries and like Pete's solution. Much more fun than buying it (even if it's cheap). 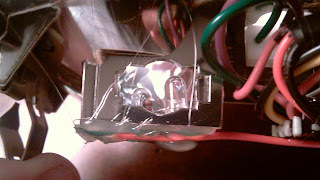 Pete, can you show a pic of the solder side after wired in series please. As an old time stereo installer from the hot hot San Joaquin Valley, I can tell you hot glue works fine in a car interior... But you must use the high temperature variety... The standard craft stuff will melt. Some of the smaller automotive exterior accessories make a difference in your car's appearance almost as much as the large ticket items. This projected started in June of 2011. Remember the Google Doodle commemorating Les Paul's 96th birthday? Well, that got me thinking about how electric guitar pickups work. I had a general idea about how they work, postulating they are essentially variable reluctance sensors, but doing a bit of research, I kind of got bitten by the electric guitar bug and dove right into the research of solid body electric guitars as a whole. The ATTiny Candle is an LED candle. It uses a high brightness LED and some software to mimic the look of a traditional candle without the dangers associated with an open flame. 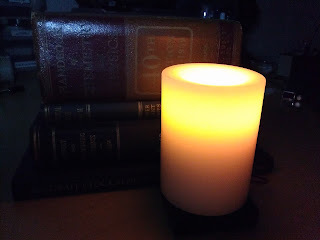 I imagine they could be useful as movie props where you cannot afford to have a candle go out during a take or in your home in places not suitable for traditional candles such as in a wall niche or alcove. 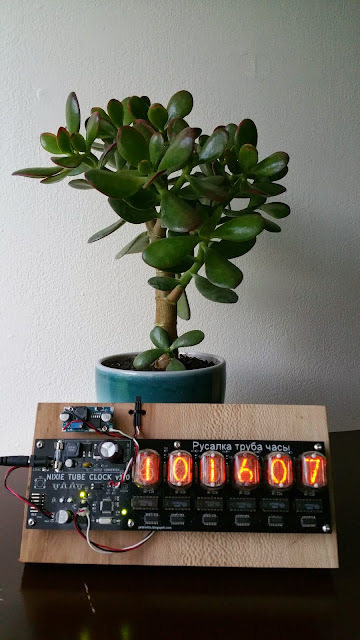 If you've poked around the internets where electronics hobbyists collect, it is likely that you are acutely aware of our incontrovertible affinity for building timekeeping clocks. 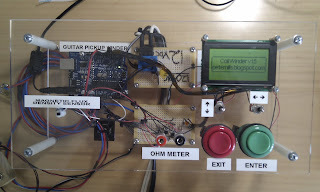 It is similarly unlikely that you have been able to evade the plenitude of nixie tube based projects. There is a reason for this. Nixie tubes are cool. They have great aesthetic appeal with their difficult-to-photograph, warm orange glow, and dem curvy numerals. They add an organic je ne sais quoi to a hobby with ostensibly digital design cues. Further, they pose technical challenges in the way of producing and switching the ~175 V DC needed to light each tube element. And as far as I am aware, there are no new nixie tubes being produced; as such, procurement can be a challenge unto itself. My N.O.S. nixies came from Russia thru Ebay, and only 3 were duds. Incidentally the seller replaced those 3, FOC.